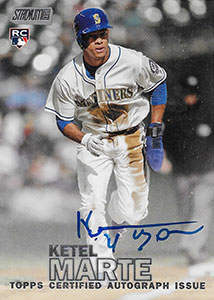 Ketel Marte was born on Tuesday, October 12, 1993, in Nizao, Peravia, Dominican Republic. Marte was 21 years old when he broke into the big leagues on July 31, 2015, with the Seattle Mariners. His biographical data, year-by-year hitting stats, fielding stats, pitching stats (where applicable), career totals, uniform numbers, salary data and miscellaneous items-of-interest are presented by Baseball Almanac on this comprehensive Ketel Marte baseball stats page. Ketel Ricardo Marte is an active Major League Baseball player who played for the Seattle Mariners (2015-2016) and Arizona Diamondbacks (2017-today). Pike, his nickname, had an impressive .351 on base percentage his first season, the fourth-best by a rookie in M's history, behind Phil Bradley (.373 in 1984), Ichiro Suzuki (.381 in 2001), and Alvin Davis (.391 in 1984) [200 or more plate appearances].